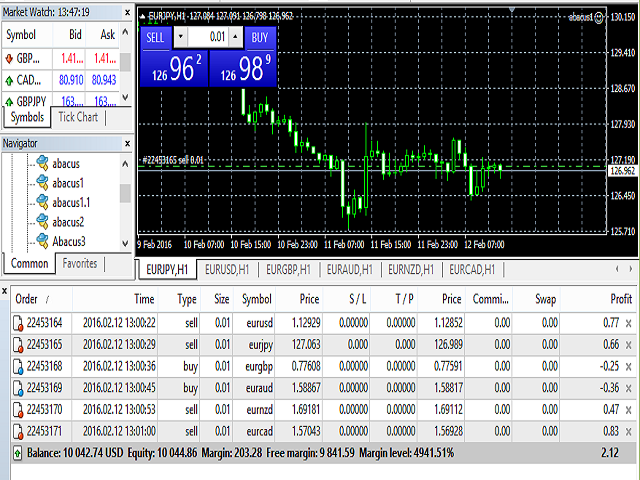 The program works on the H1 period, does not place StopLoss and TakeProfit, opens orders and closes them itself. the program opens a sell or a buy order regardless of the price movement. the program checks the opened orders of the current symbol, if the price goes in another direction, then the order is deleted and a new one is opened according to the price direction. It is necessary to specify the lot in the Lots parameter. The on parameter - time to start the program, in hours. For example, if you want the program to start at 10 am, then set on = 10. The off parameter - time to stop the program, in hours. For example, if you want the program to be removed and to stop opening orders (turned off) at 10 am, then set off = 10. EA with a lot of trades. Added parameter: magic - order magic number. Added two parameters: on and off. Now, the program removes only the orders it placed without disturbing others.